This is the traditional Bavarian costume that has inspired a real and typical style, a type of clothing line called Landhausmode, inspired by the clothing of the peasants, farmers and country people. The quality of the fabrics and the decoration symbolised the social status of those who wore it. Today, there are those who still wear this clothing even for weddings. See below a description of both versions, for the men, which included the classic shirt and Lederhosen – the leather shorts, and for the women, the inevitable Dirndl. The Dirndl came about in the XIX century as the uniform of the Austrian servants. In 1870 however it came to be admired and was even worn by the bourgeoisie, becoming a highly fashionable outfit. Today there are in fact cheap and other more expensive versions. The upper part is made up of a blouse and bodice, and the bottom a skirt and apron. Traditionally, only natural colours were originally available in the nineteenth century, the spring and summer version, made of lighter fabrics and with short sleeves, have pastel and light colours, while the autumn and winter versions are long-sleeved with heavier fabrics, also characterised by their dark colours. With artificial colouring, Dirndl with bright vibrant colours are also available on the market. When you see a woman wearing a Dirndl, pay attention… you can tell her relationship status; if the apron has the knot on the left side, this means that the woman who is wearing it is single, but if the knot is on the right side, forget it…she’s with someone. 1. Wig: If you wish to be very “topical” for the Oktoberfest and you want more than your normal hair, why not wear a wig? Here, it can only be blond, with long braids. 2. The Dirndl Blouse: Obviously one piece you cannot go without, is the upper piece of the traditional costume and it can be found in all styles, from the more classic and with a high cut and more formal, to those that are sexier and outrageous. 3. The Dirndl Bodice: Like all bodices it will tighten your waste and will give you a more attractive and elegant figure. Many patterns are incorporated into the blouse. 4. The Dirndl skirt and apron: together with the top part, skirt and apron complement the traditional outfit. The traditional Dirndl reaches the ankles, but can now be found in hundreds of varieties! 5. Stockings: They are usually white in colour, like short stockings, and most include a bow that connects to the Dirndl. 6. 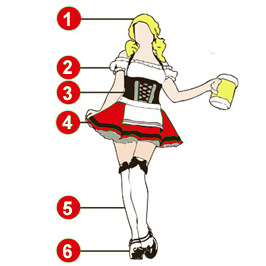 Shoes: If you intend wearing a Dirndl during the Oktoberfest, make sure to wear comfortable shoes. Nothing is certainly sexier than a pair of shoes with a heel, but the Oktoberfest is a festival, in a huge place, and with hundreds of thousands of people … comfort is essential. 7. The Trachtenhut: The classic alpine felt hat. The model has its origin in the Tyrolean Alpine region. Usually it has a band wrapped around the base and is adorned with chamois hair, the iconic Gamsbart, taken from the bottom part of the animal’s neck. The Gamsbart is substantially a hunting trophy and therefore the greater the length, the greater the skill of the hunter that wears it. Tractenhut lovers have collections of pins to attach to their hats. Copies are also available on the market with the original shape but made of fake felt at a lower cost. 8. Jacket: not just any shirt can be worn with the lederhosen. A classical and traditional shirt can be of uniform white colour or with a coloured chequered motif. 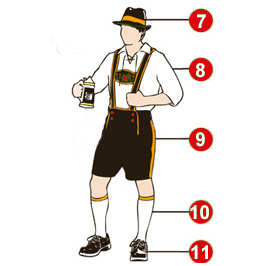 With some costumes the shirt is sold directly with the lederhosen. 9. Lederhosen: They are the classic and traditional Bavarian shorts, a “must” during the Oktoberfest, not to be confused with its cousin, the bundhosen, which is longer. The shorts are particularly sturdy in goat leather (or calf) incorporating the standard braces (Hosenträger). In the more expensive versions, the leather used can also be deer or chamois. In the XV century they were worn as a work garment mainly in Germany, Austria, Trentino-Alto Adige and Switzerland. the lange Lederhose end at the ankle. The Messertasche, a pocket found on the right leg, is used as a knife holster. The traditional colour of Lederhose is clearly that of the leathers of which it is made and thus either brown or black. Today, however, they are also made in other colours with leather tanning, without however departing from the natural colours and tones, such as for example grey and green, especially in darker tones. 10. Stockings: The traditional Bavarian stockings that cover the whole calf, made of thick wool and often with a bow. 11. Haferlschuhe: The traditional shoes worn with the lederhosen are called Haferlschuhe, originally made as a work shoe in the Alpine region, and which today have become a true classic, also due to their sturdiness and stability, provided by the reinforced toe and studded sole. In Bavaria they are also known as Bundschuh, while in Austria, they are called Schützenschuh. Legend has it that in 1803 the shoemaker Franz Schratt, created the Haferlschuhe inspired by a goats hoof. In all probability the origin is however, even more ancient.